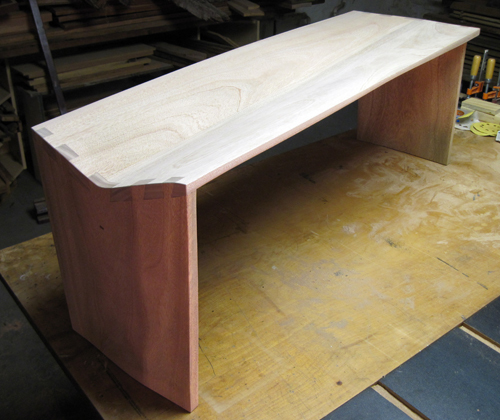 The “flume bench” is completely finished, so here are a few snapshots. 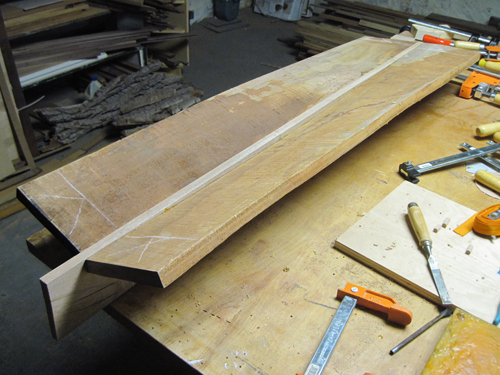 I elected to use a higher build finish than usual (this was a seven-coat process) in order to create a counterpoint between the “reclaimed” aspect of the raw lumber and the “refined” aspect of the finished piece. Even with a satin finish there is a great deal more reflectivity than I am used to, but it feels right to me at the moment. 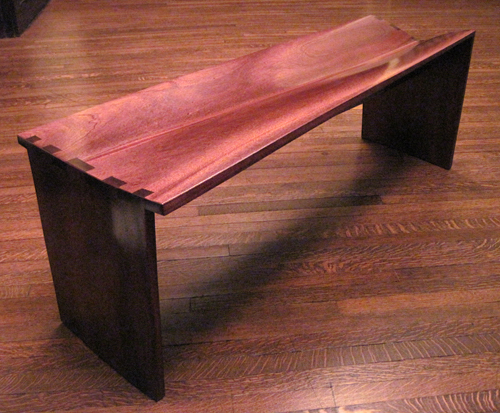 This entry was posted in custom furniture and tagged African Mahogany, bench, satin finish on June 17, 2010 by johnsarra. 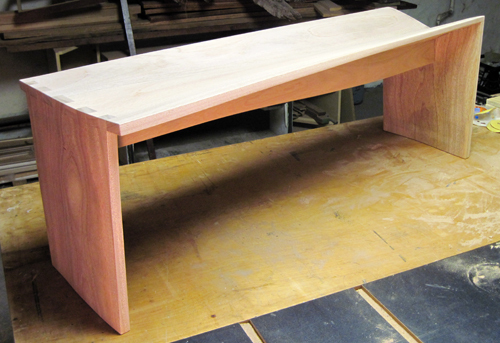 The “flume” bench is built, and I am in the midst of the staining/finishing process. 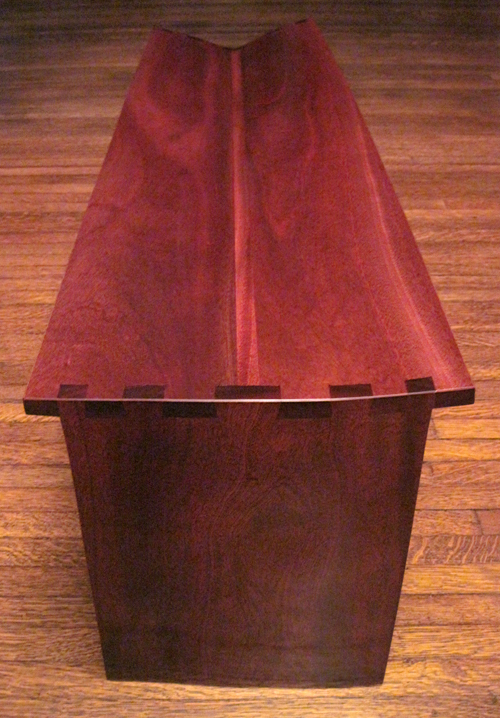 I ended up deciding that dovetails were the best design decision for both ends of the bench. Cutting them was a bit tricky, as there are no flat surfaces involved. 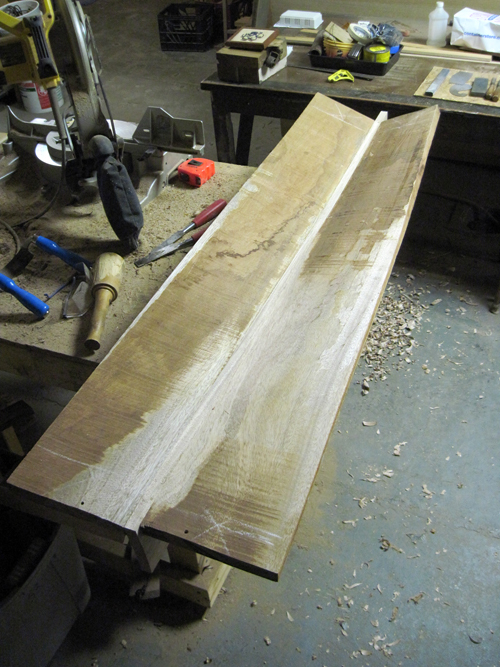 But when you are cutting joints by hand, the irregularity of the surfaces is incidental. It boils down to marking well and sawing well. 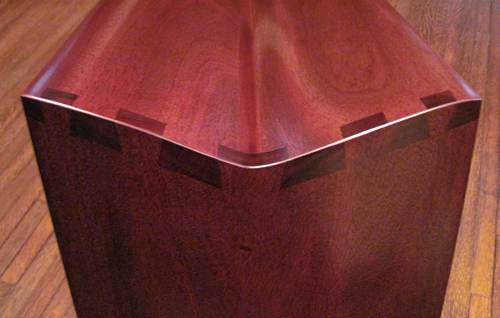 The African mahogany is not particularly forgiving, as it is very dense and prone to chipping, but I managed to make it work and am pleased with the results. I ended up cutting the bottom edge of the the vertical “keel” support into a curve to eliminate the last bit of strict geometry. 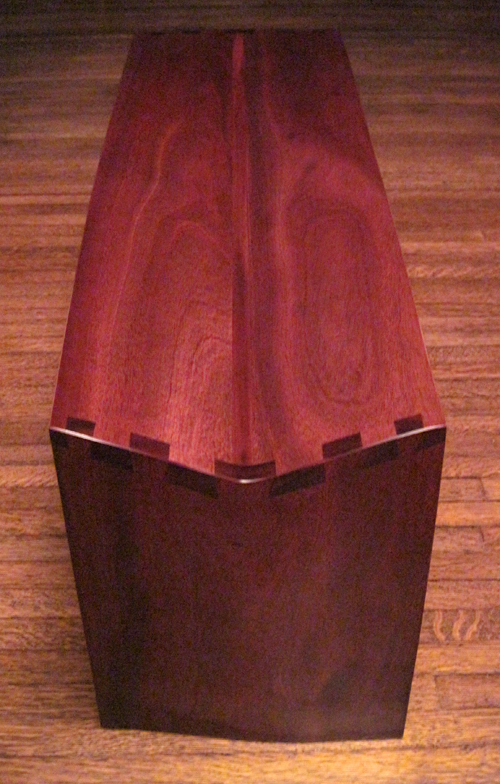 It extends into a mortise in each leg, where it is fastened from the outside with a wedged dowel. I’ve been thinking about benches as expressions of transience, as they tend to encourage you both to take a rest and to move on. When sitting on this bench, the variation in form actually made me want to move around and try out each contour for degrees of comfort. 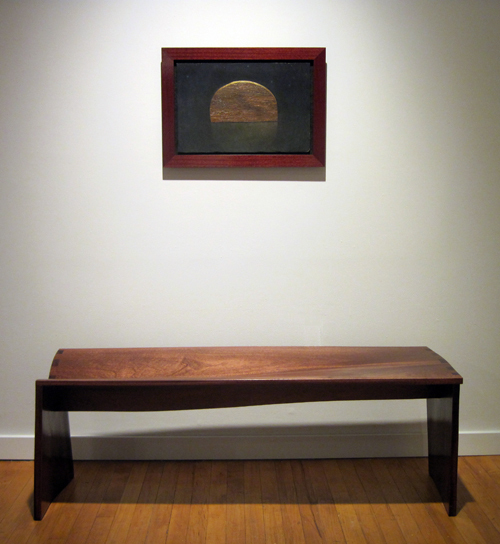 The slight slope reinforces the sense of transience, making “flow” a visceral and tangible experience for the sitter. 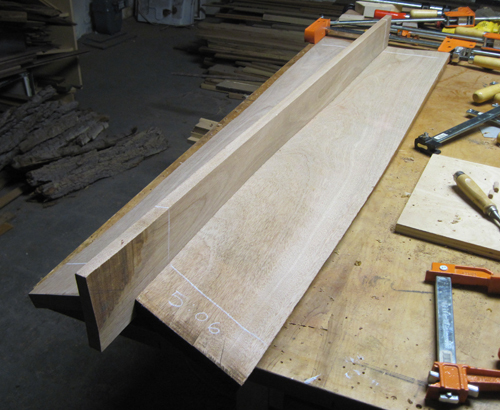 This entry was posted in custom furniture and tagged African Mahogany, bench, dovetail, flow, flume, joinery, keel, tangible, wedged dowel on June 10, 2010 by johnsarra.